of Billy Pierce in Chicago. Do you like who you collect? Q: Being a team collector, people want to know…does he live in Chicago area, past or present? A: Believe it or not, but I have never lived in the Chicago area. I grew up in Southern California, fairly close to Anaheim. 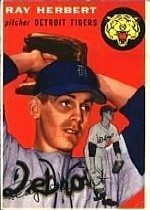 Starting at the age of 12 or so, I attended lots of Angels games (and few Dodgers games) with my father. After a while, he encouraged me to bring baseball cards to the games to try to get autographed during batting practice. I ended up having a passion for autographs, and I soon graduated to hanging out before and after games to get autographs as the players arrived and departed from the stadium. That soon led to hanging out at team hotels, etc. During my first couple of years getting autographs, the White Sox players were by far the nicest to me, and I started rooting for them. Here it is approximately 21 years later, and I’m now a die-hard ChiSox fan and collector. All because they were nice to me when I was a kid. Particularly Frank Thomas, who is my favorite player to this day. A: Since I don’t live in Chicago, I can’t really answer the question as intended. But I can say that being a White Sox fan in Florida isn’t a lot of fun. I don’t know of any other Sox fans in my area, so I have nobody to share my fandom with. The only benefit that came from living in Florida was being able to attend the playoff games against the Rays in 2008. Q: First ever ChiSox autograph, in person or by mail? A: My first ChiSox autograph also happened to be my first autograph, period. It was from third-string White Sox catcher Matt Merullo, some time during the 1991 season. Unfortunately, I can’t remember the actual experience. I recently wrote a letter to Merullo, and told him that he was my first autograph, and that the friendliness of Sox players such as himself is the reason I’m a die-hard fan to this day. He wrote me a really nice note, saying how cool it was that he was my first autograph. Q: How long have you collected White Sox autographs? What have you learned in the journey? A: As stated above, I’ve collected Sox autographs for approximately 21 years. It was about 5 years ago that I decided to streamline my collection and focus solely on the White Sox. Prior to that I collected everything, including all 4 major sports and also actors and musicians. Living in SoCal I had decent access to Hollywood. Eventually I learned that the Sox stuff brought me the most joy, and I could really expand my collection by focusing strictly on the Sox. It was a great decision for me, and my collection is MUCH better than it would have been had I continued collecting everything. Q: I agree that Billy Pierce is a prince among White Sox signers. What former Pale Hosers have sent you extras TTM (bonus inscriptions, extras, even a note or letter)? A: I have received extras in one form or another from Virgil Trucks, Matt Merullo, Billy Pierce, Jim Landis, and I’m sure a few others. The best extra I ever received was from Bob Shaw. One day I received a large manilla envelope with a return address for Mr. Shaw. Out of the blue he had sent me a Photofile 8×10, signed, personalized, and inscribed. He was already a favorite of mine, and this just showed why. Q: What’s been your experiences graphing the White Sox in person, at either old Comiskey, the new ballpark or spring training? A: Unfortunately, I have never graphed the Sox at their stadium in Chicago. Not unless you count autograph events like Picnic in the Park, or the former players that show up in the Scouts Seat lounge. 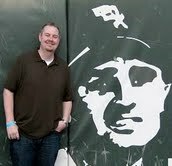 I did go to Arizona last spring (2011) and spent 5 days graphing the Sox spring training site. I have to say, it was probably the best graphing experience of my life. With a few exceptions (Guillen, Cora, Vizquel, Buehrle, Rios), every player signed just about every day. Also, I had designed a panoramic showcasing what promised to be a great pitching staff (Buehrle, Danks, Floyd, Peavy, Jackson). Three of the pitchers were very complimentary of the piece, asking if they could have one for themselves. Q: Have you sought TTM White Sox-related autographs of off-the-field names, people like organist Nancy Faust or Disco Demolition’s Mike Veeck? What do you ask the to sign? Have you made custom cards? A: The only off field autographs I have obtained TTM are from Nancy Faust. She has signed several cards for me. She was in several of the Coke seats in the mid-late 80s. I also had her sign the US Cellular Field card in the 2010 Upper Deck set (for my all-time UD project), as she was the first person I thought of when I thought of the Sox home stadium. I would like to get groundskeeper Roger Bossard at some point, but I’m not sure what to have him sign. Maybe I will design a custom card. Q: Specific future goals for autograph collecting? A: My main project is to get every Upper Deck White Sox base card autographed. Upper Deck produced base sets from 1989 – 2010, totaling 529 Sox cards. I would say I’m about 75% of the way there. Coming Monday: My advice for breaking a TTM slump. 9 innings in my first start. I felt like Ray’s catcher. I asked for details about one of countless important dates in his career. He did the rest. I chose September 26, 1962. Exactly one year earlier, he homered against the Red Sox. Same team. Same date. Same result! What was fan mail like during the 1950s? Today’s fan mail is a different story.